Enjoy the taste of Louisiana Cajun cookin' any night of the week with a classic one pot meal! 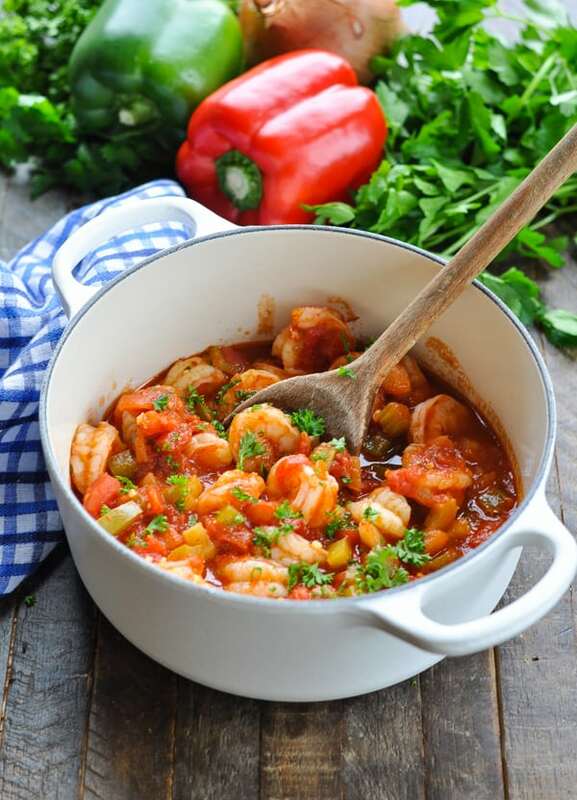 This Shrimp Creole is an easy and healthy dinner recipe that's ready in about 30 minutes! Enjoy the taste of Louisiana Cajun cookin’ any night of the week with a classic one pot meal! 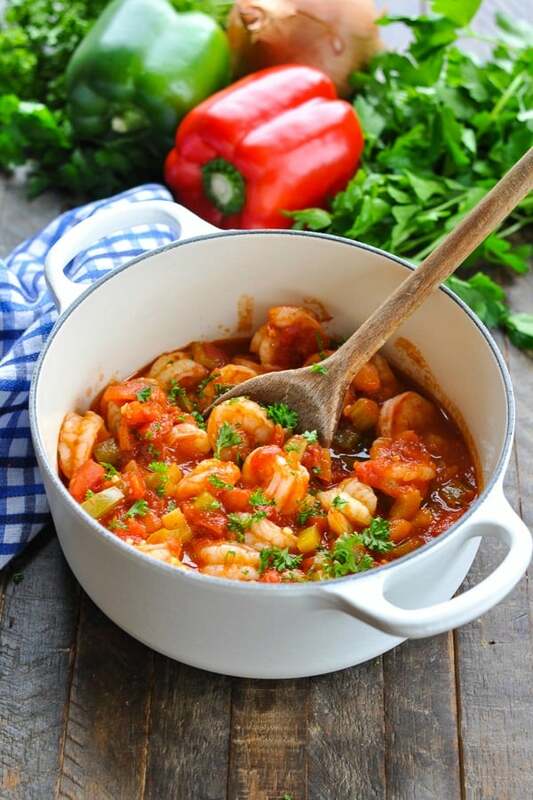 This Shrimp Creole is an easy and healthy dinner recipe that’s ready in about 30 minutes! Friends, there is so much flavor in this one dish! On those nights when you just don’t have much time to cook, this nutritious and satisfying meal is the perfect solution. You can adjust the heat to keep it kid-friendly, or splash it with hot sauce for some true Cajun heat! On a bed of fluffy white rice, this is an easy dinner that the whole family can enjoy. 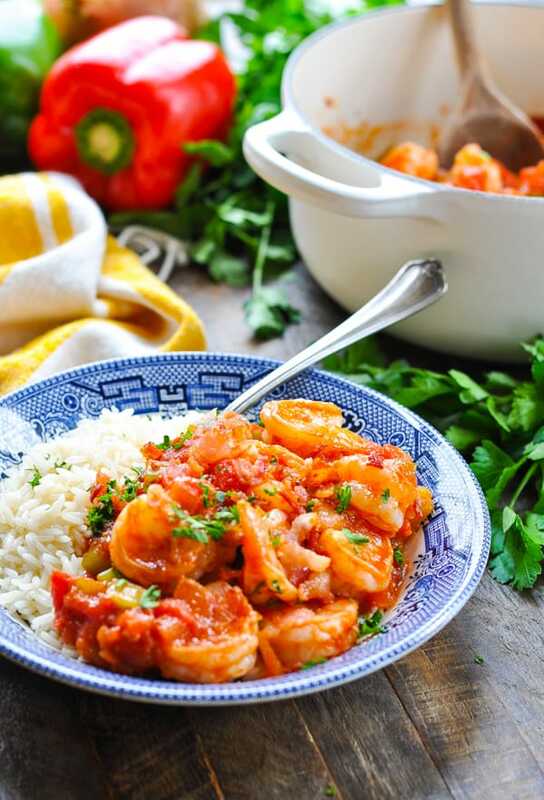 This is a dish of Louisiana Creole origin, which includes cooked shrimp in a sauce of tomatoes, the “Holy Trinity” of bell pepper, celery and onion, and spiced with hot pepper sauce. It’s typically served over a bed of white rice (source). 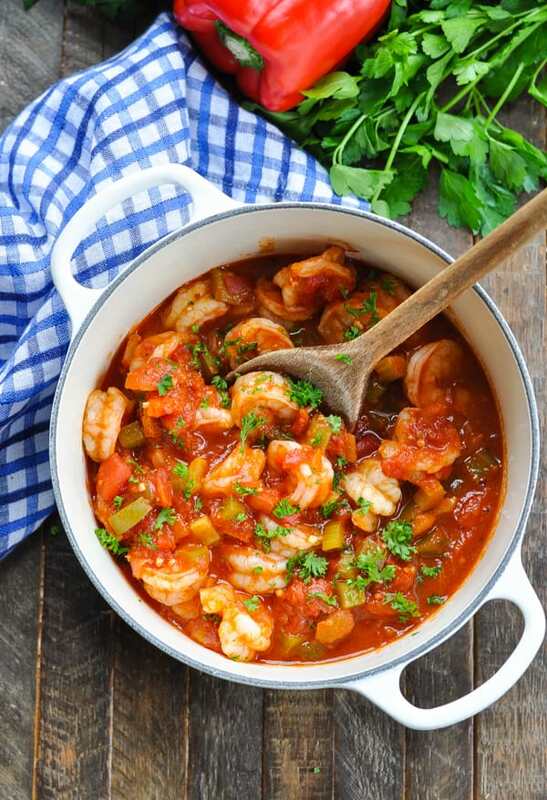 What is the difference between Étouffée and Shrimp Creole? Shrimp Étouffée has a roux base, which is a thicker sauce that’s more like a gravy. 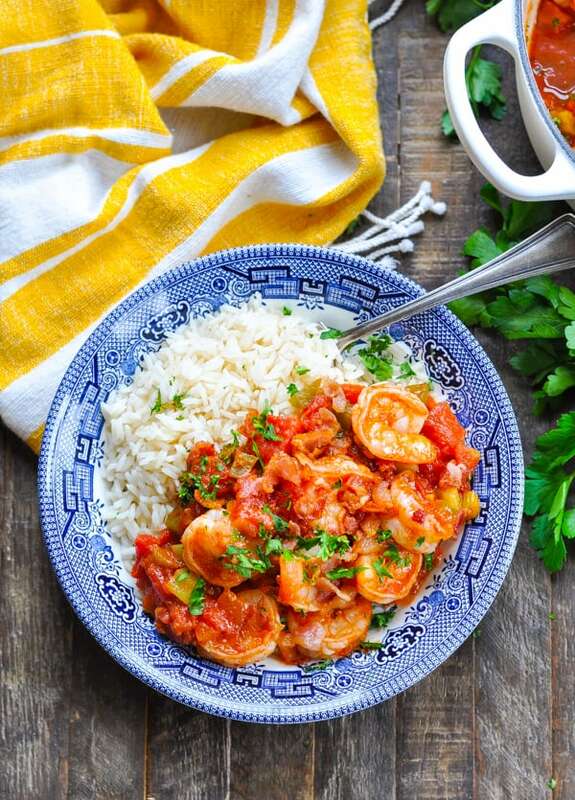 By contrast, Shrimp Creole has a thinner, tomato-based sauce. Étouffée is usually spicier than Creole, too. First, fry chopped bacon in a large skillet or Dutch oven. 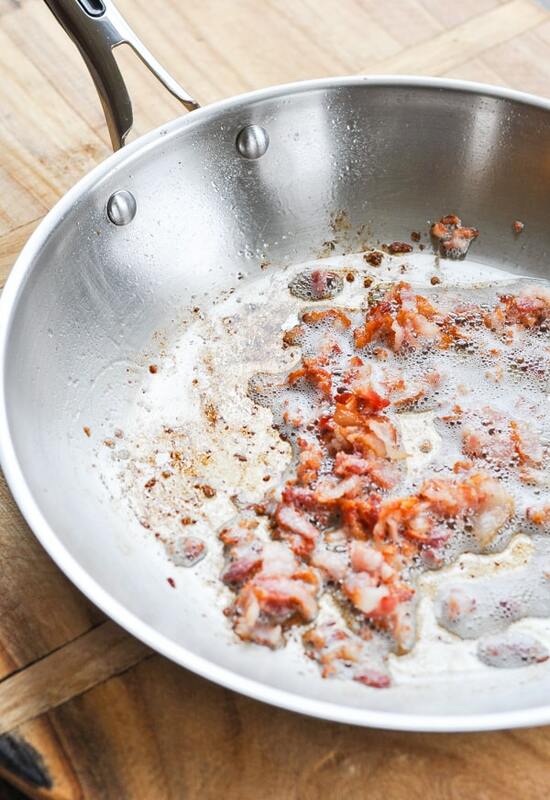 Remove the crispy bacon from the skillet and set it aside (you’ll use it later for a garnish). 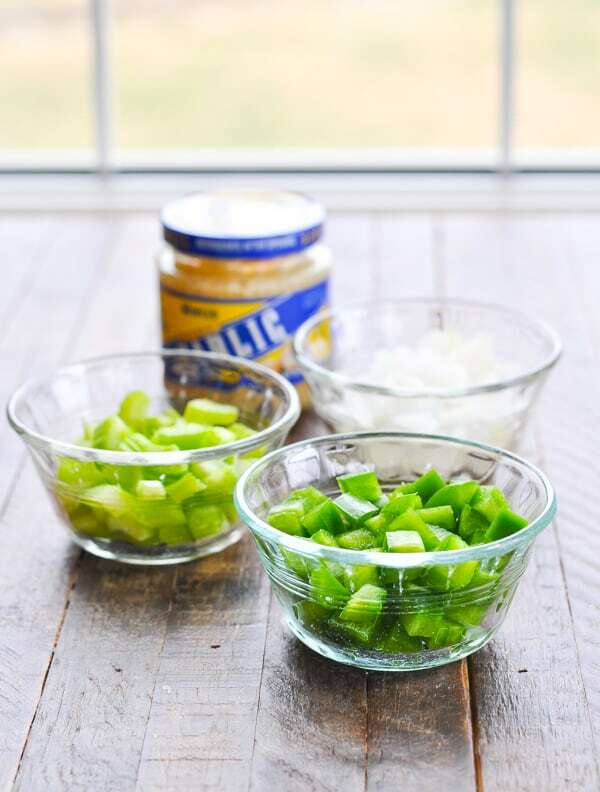 Leave the bacon drippings in the pan and add the “Holy Trinity” of Cajun cooking: bell pepper, celery and onion — plus some minced garlic. Simmer the sauce until it thickens. This will take about 7 minutes. Finally, stir in the shrimp! The shrimp will cook quickly, so they should turn pink in about 5 minutes. That’s when you know that the dish is done! Serve the shrimp and sauce over rice and garnish with chopped fresh parsley and the crispy bacon! Yes, but not overpowering. This particular recipe can be made spicy or mild, depending on your taste preferences. When serving my children, I omit the hot sauce entirely, and then allow each individual to garnish his bowl with the desired amount of hot sauce after serving. This keeps everyone happy! Yes! It’s flavored with a small amount of bacon, but the rest of the dish is made with lean protein (shrimp) and plenty of healthy vegetables. It’s a light dinner with just 236 calories per serving. 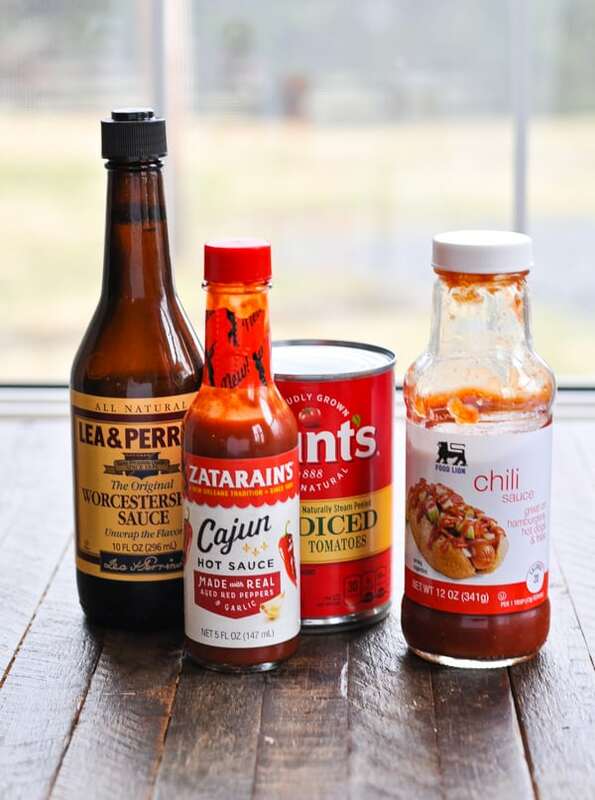 This recipe can be made gluten-free, but it’s important to make sure that you find a gluten-free Worcestershire sauce and a gluten-free chili sauce. How long does Shrimp Creole last? Properly stored in the refrigerator in an airtight container, the cooked shrimp is good for 3-4 days. 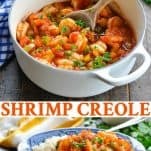 Can Shrimp Creole be frozen? Yes! Wrapped tightly, any leftover shrimp will keep in the freezer for 2-3 months. 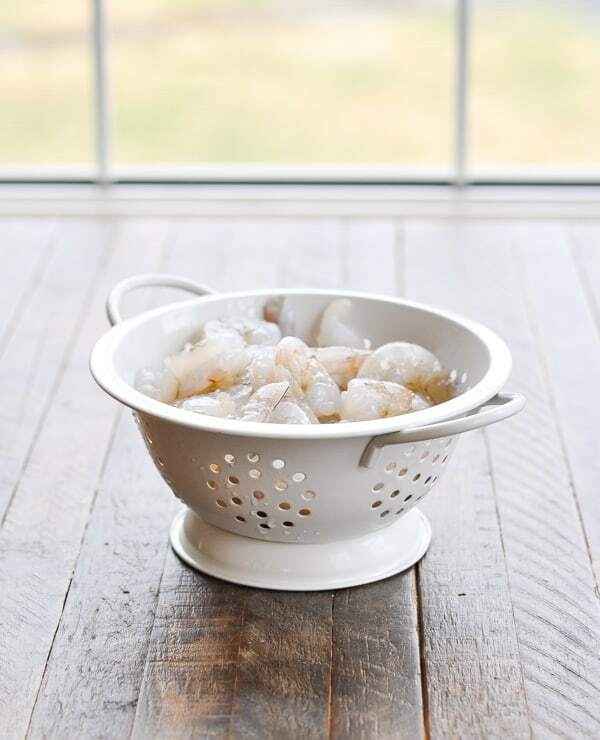 If frozen, allow the shrimp to thaw in the refrigerator overnight. 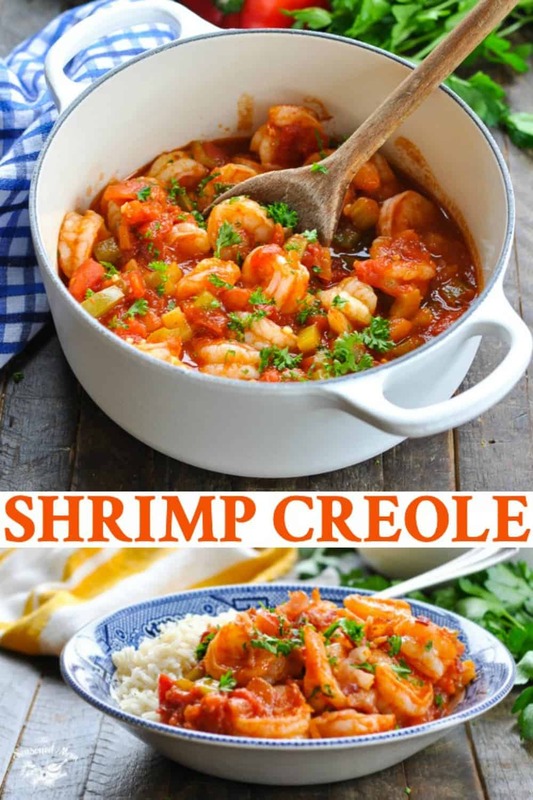 Place the shrimp and sauce in a skillet or pot. Cover and heat over low heat just until warmed through. You want to make sure that you don’t cook it too long and make the shrimp tough. You can also place individual servings in a bowl, cover, and warm in the microwave for 1-2 minutes. 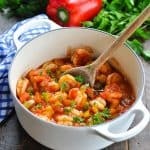 What should I serve with Shrimp Creole? What wine goes with Shrimp Creole? When pairing wine with spicy Cajun food, it’s usually best to look for dry, sweet or bubbly white wines, which help balance the flavors in the food. Rosé and blush wines are great because they’re typically lower in alcohol content, which means that they don’t create a spicy burn in your mouth when paired with a spicy meal. Dry white wines like Sauvignon blanc and chardonnay are also good options to cut down on the spicy palate. This recipe yields 4 relatively small servings. If you’re feeding a larger family, I suggest doubling the recipe. By contrast, if you’re feeding just 1 or 2 people, you can cut the ingredients in half and follow the same cooking instructions. What size shrimp for Shrimp Creole? I used “extra large” shrimp (16-20 count per pound), which were previously frozen. I just thawed them in the refrigerator overnight before using them in the recipe. If you prefer larger or smaller shrimp, that’s fine — just adjust the cooking time during the final few minutes. Be careful to keep a close eye on your shrimp as they’re cooking. It only takes a few minutes, and you want to remove them from the heat as soon as they turn pink. Overcooked shrimp are tough and not very appetizing! Garnish the dish with fresh parsley and the cooked, chopped bacon. The parsley adds the perfect bright, fresh finish to the dish. Make a Shrimp Creole with Okra by adding chopped fresh or frozen okra to the dish when you add the rest of the vegetables. 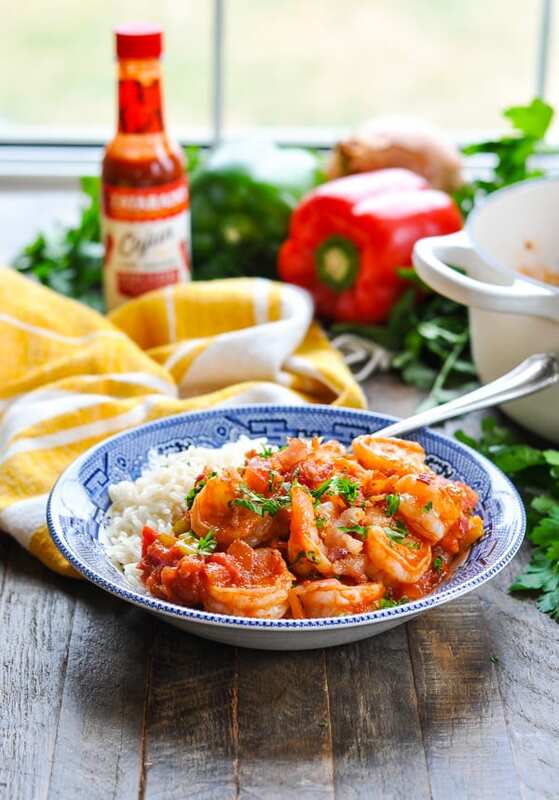 Create a Spicy Shrimp Creole by using more hot sauce. To keep the dish mild and kid-friendly, omit the hot sauce or only use a little bit. 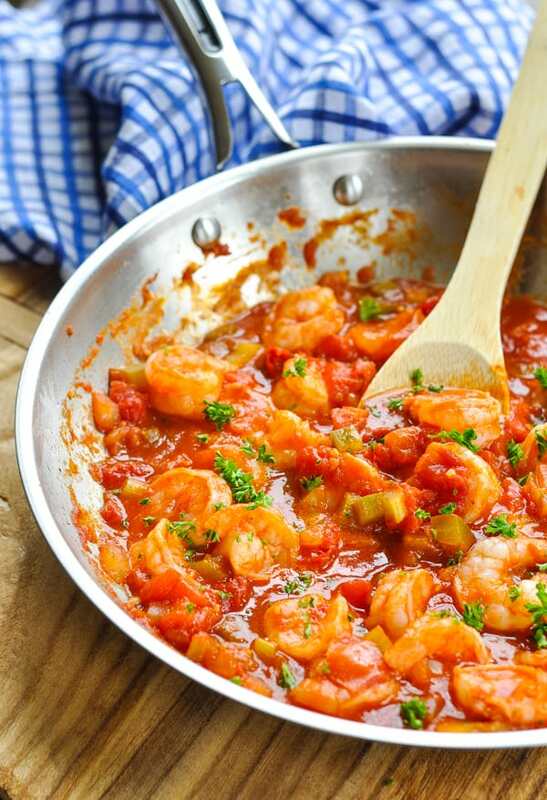 Serve a Shrimp Creole Pasta by spooning the shrimp and sauce mixture over cooked pasta instead of rice. Fry bacon in a large skillet or Dutch oven (about 5 minutes). Use a slotted spoon to remove the cooked bacon, but leave the drippings in the pan. 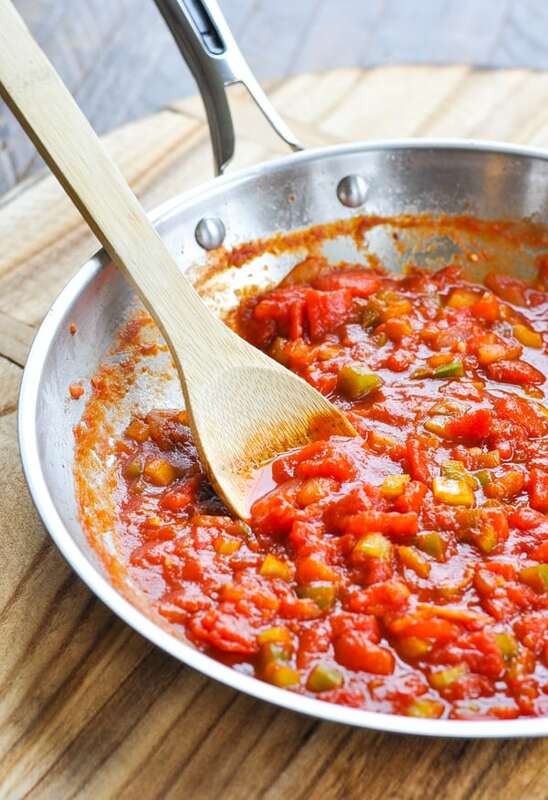 Add bell pepper, onion, celery and garlic to the skillet with the reserved drippings. Cook over medium-high heat, just until soft (about 3-4 minutes). Add tomatoes, chili sauce, Worcestershire sauce, salt, pepper and hot sauce. Reduce heat to low; simmer until thick, stirring occasionally (about 7-10 minutes). Add shrimp and cook just until pink (about 5 minutes). Serve over rice and garnish with cooked bacon and fresh parsley, if desired.